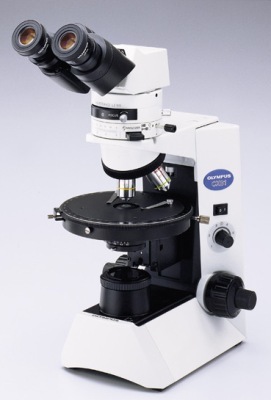 The CX31-P microscope is ideal for polarized light observations. Compact in design , yet capable of technically advanced tasks such as retardation measurements , the CX31P is a wise choice for daily laboratory use. CX31-P space saving body offers high quality polarized images and a wide range of options.This model is a cost-effective solution with a versatility of functions. Choose from specially manufactured strain-free objective lenses (PLN4xP, ACHN-P and UPLFLN-P) that are designed to ensure the highest quality images during polarized observations. Specially designed condenser and polarizing filters offer, high EF value and provide greatly enhanced polarized light images. Various operations are centralized including switching between the conoscopic and orthoscopic methods by the insertion/removal of a Bertrand lens. To make the most of the superior optical performance, the basic performance has been enhanced with a highly rigid frame, interior focus mechanism and stage. The binocular observation tube has a mechanism that allows interpupillary adjustment without inclination of the reticle such as a cross-hair in an objective lens. This enables exact alignment of the vibration direction of polarization.